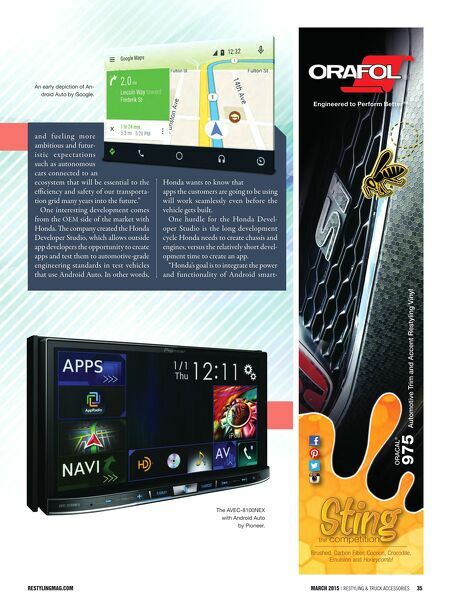 34 Restyling & tRuck AccessoRies | March 2015 restylingmag.com 34 Restyling & tRuck AccessoRies | March 2015 restylingMag.coM "CarPlay enriches the iPhone experience in the vehicle by providing a safer way to access the iPhone features they want to use most while driving ," said Ted Cardenas, vice president of marketing for the Car Electronics Division of Pioneer. " With Pioneer's implementation, CarPlay can now be integrated into millions of vehicles already on the road." So how does it work? CarPlay allows spe- cific apps that are deemed safe to operate on the road to be brought up right on the home screen. Typically, a CarPlay user will see these options available from the home screen: Phone, Music, Maps, Mes- sages. Options are available to also include iHeartRadio and Podcasts. Additionally, to aid in safe operation of the infotainment system, Apple has included Siri to handle voice commands from the user. A great add-on with a CarPlay-powered infotainment system and upsell opportu- nity for shops is to offer bolt-on steering wheel control interfaces. ese buttons can be utilized to summon Siri, adjust stereo volume and change songs. A Look At Android Auto A lot of the support for Android Auto came from the formation of the OAA, or Open Automotive Alliance. 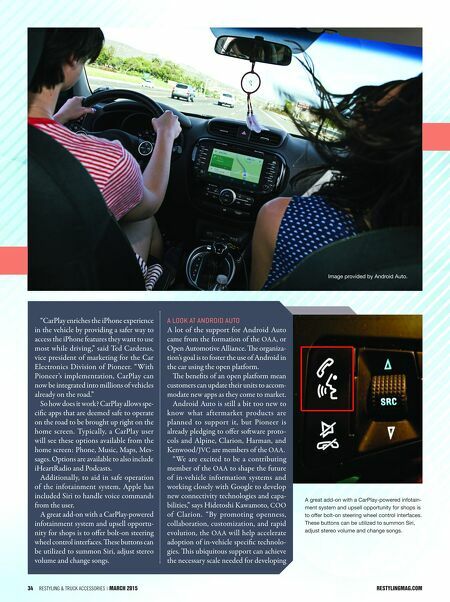 e organiza- tion's goal is to foster the use of Android in the car using the open platform. e benefits of an open platform mean customers can update their units to accom- modate new apps as they come to market. Android Auto is still a bit too new to know what aftermarket products are planned to support it, but Pioneer is already pledging to offer soware proto- cols and Alpine, Clarion, Harman, and Kenwood/JVC are members of the OAA. " We are excited to be a contributing member of the OAA to shape the future of in-vehicle information systems and working closely with Google to develop new connectivity technologies and capa- bilities," says Hidetoshi Kawamoto, COO of Clarion. "By promoting openness, collaboration, customization, and rapid evolution, the OAA will help accelerate adoption of in-vehicle specific technolo- gies. is ubiquitous support can achieve the necessary scale needed for developing Image provided by Android Auto. A great add-on with a CarPlay-powered infotain- ment system and upsell opportunity for shops is to offer bolt-on steering wheel control interfaces. These buttons can be utilized to summon Siri, adjust stereo volume and change songs.